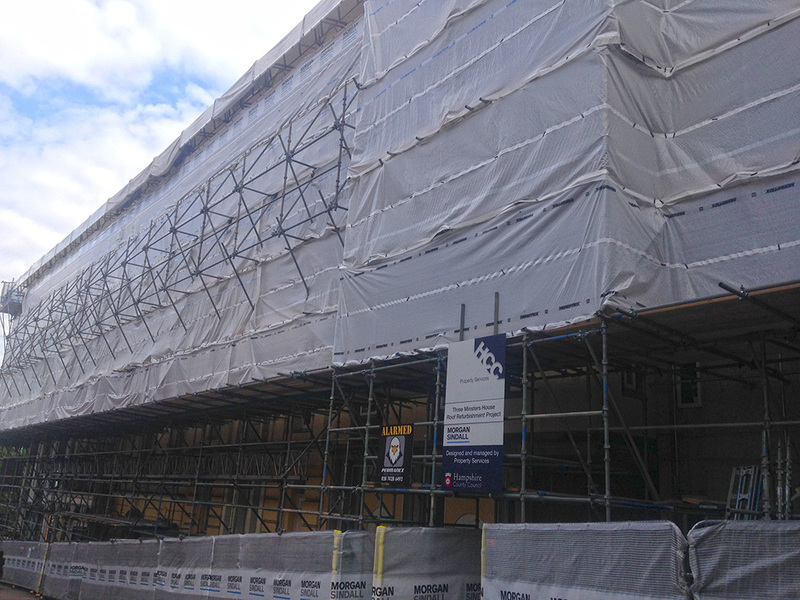 RBS own over 300 tonnes of Cuplock and HAKI system scaffolding. RBS were approached by the client Nordic Construction who were required to refurb the existing Marland House into student accommodation. The project required the underground car park to remain operational along with the commercial units. 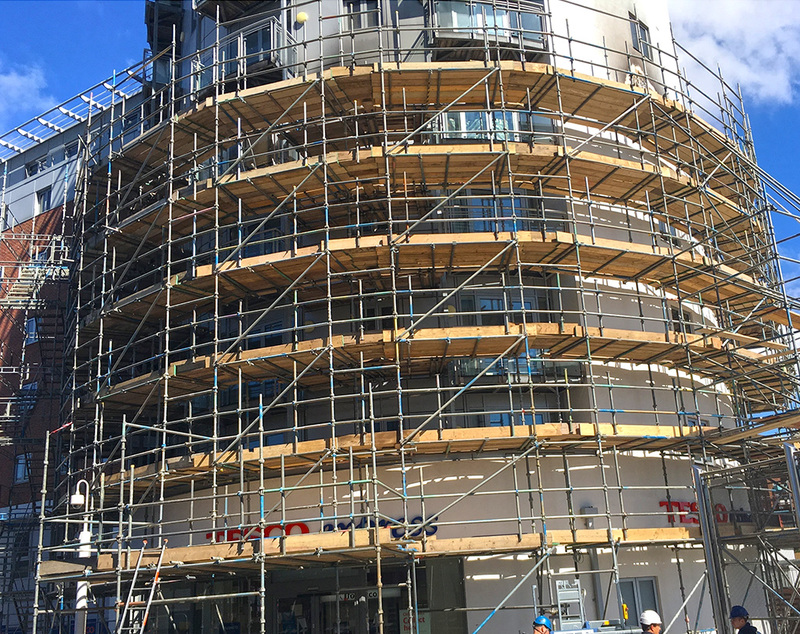 The scaffold (weighing 150 tonnes) was designed to incorporate a traditional tube and fitting gantry spanned over the car park with system scaffold giving perimeter access around the existing building. Although the original client run into difficulties a successful compromise was negotiated with the new contractors STK Properti Ltd. 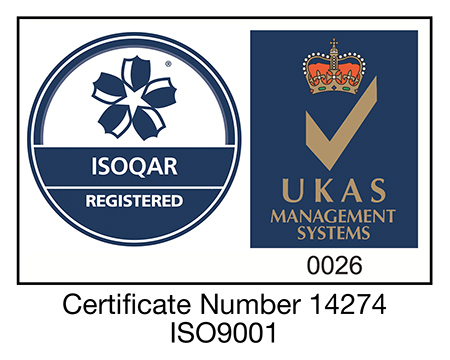 The project was completed to the satisfaction of all parties including the client. 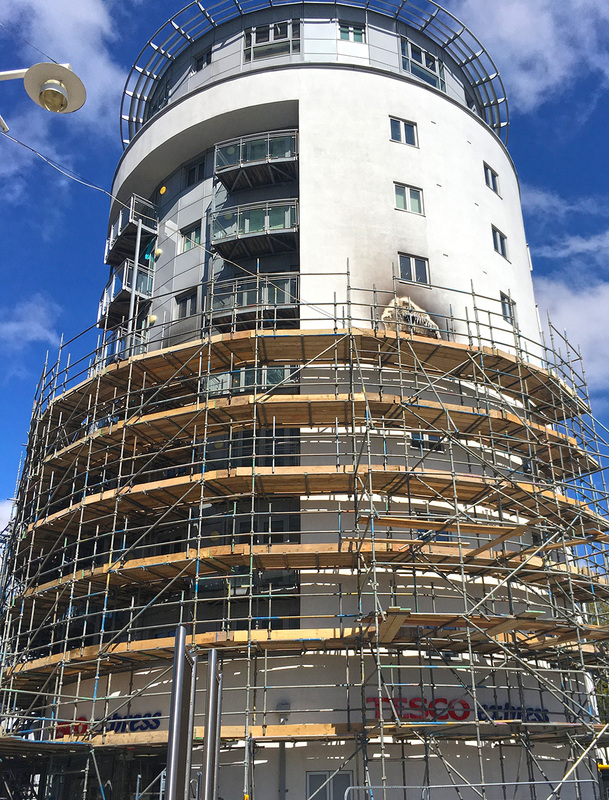 The Gunwharf Round Tower project came about due to an unfortunate fire in an apartment on the 5th floor of the Round Tower. Due to the tight curve of the circular building and the added complication of allowing continuous access to the Tesco Store at the base of the apartment block, it was decided ‘System Scaffold’ was the answer. 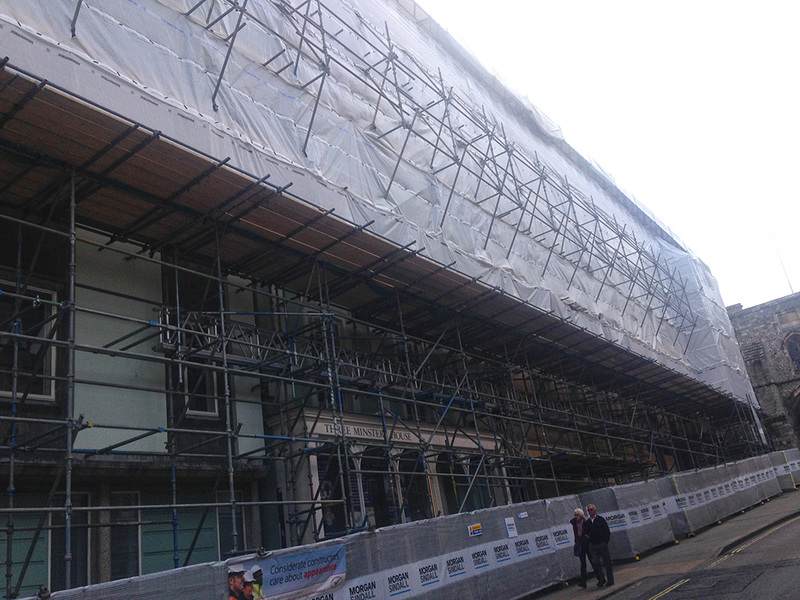 This allowed faster erection of the scaffold to access the repair works as early as possible. This minimised the amount of disruption to both the store and the residents. 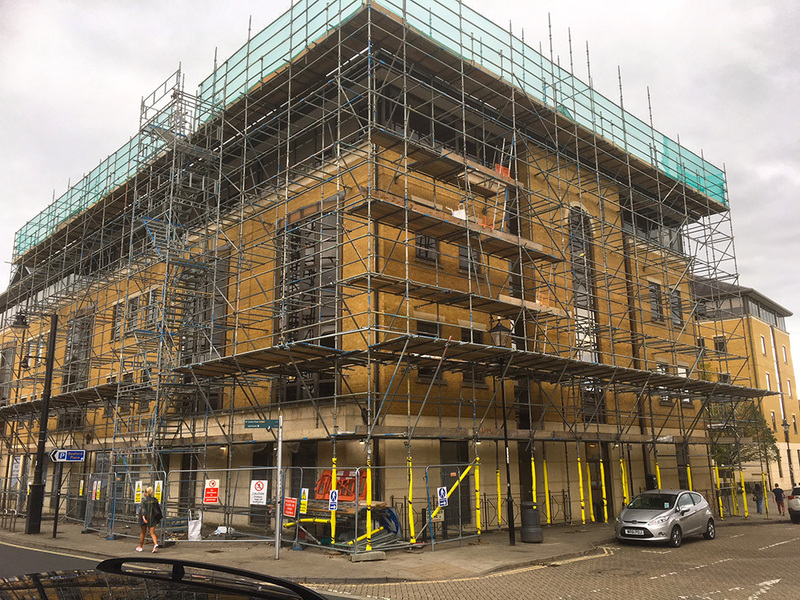 The other main consideration was the requirement to remove a centre section of the scaffold to allow the removal of the steel balcony structure that was severely damaged by the heat. 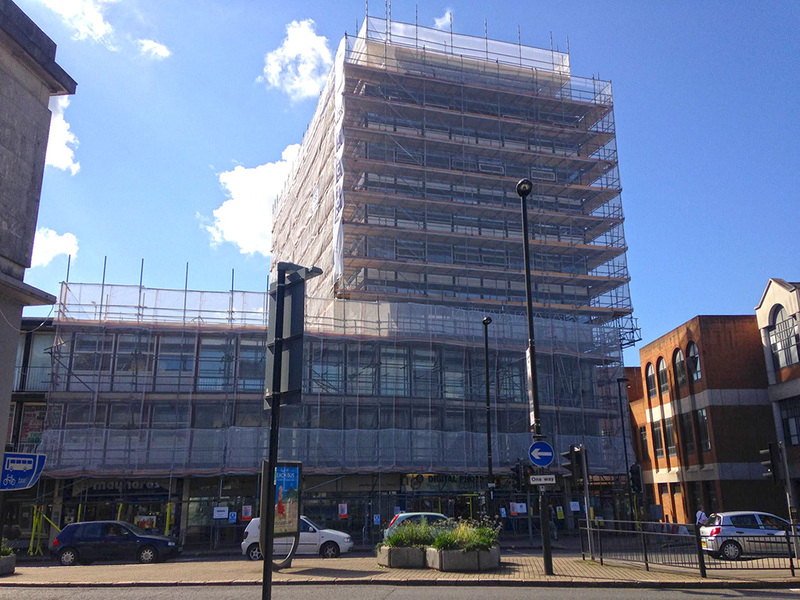 Cuplok scaffold again was the answer and when it came to the removal of the balconies we were able to remove around 8.00m length x 12.00m Height without affecting the design of the scaffold. The Contractor removed the steel balconies and the scaffold then re-erected full height including infills to the void left by the balconies. Had the scaffold been erected in traditional tube and fitting this adaption would have been very difficult. A 14m high HAKI staircase was also fitted to allow quick access to each lift. With the ability of the Cuplok System to follow the contour of the building, and the ease of filling the links between the towers system was by far the most logical and cost-effective option. 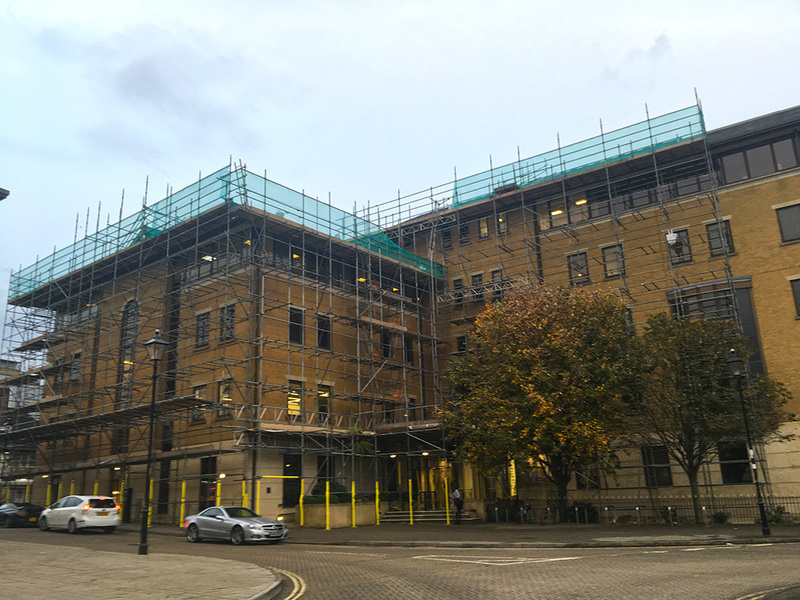 RBS were approached by Morgan Sindall to commission a bespoke design to provide an access scaffold and temporary roof to facilitate the complete renovation of Hampshire County Council’s offices at Three Minsters House. The final scheme was a hybrid solution using both Cuplok and Haki systems. The external access was designed and constructed with Cuplok with a Hakitec 750 System temporary roof covering an area of 60.00m x 25.00m providing protection from the elements. As there was no room for sections of the roof to be pre-built on the ground and craned into position, the roll-out method devised by HAKI was employed which meant that the system could be erected from a safe working platform at one end of the building and progressively rolled out into place. To complete the structure, access for site personnel was provided by two HAKI staircases whilst materials were raised using a GEDA 1500ZZP rack and pinion hoist. The Mountbatten House project was carried out over the last quarter of 2017. The project required a scaffold being built to eaves level to allow repairs to the slated roof. 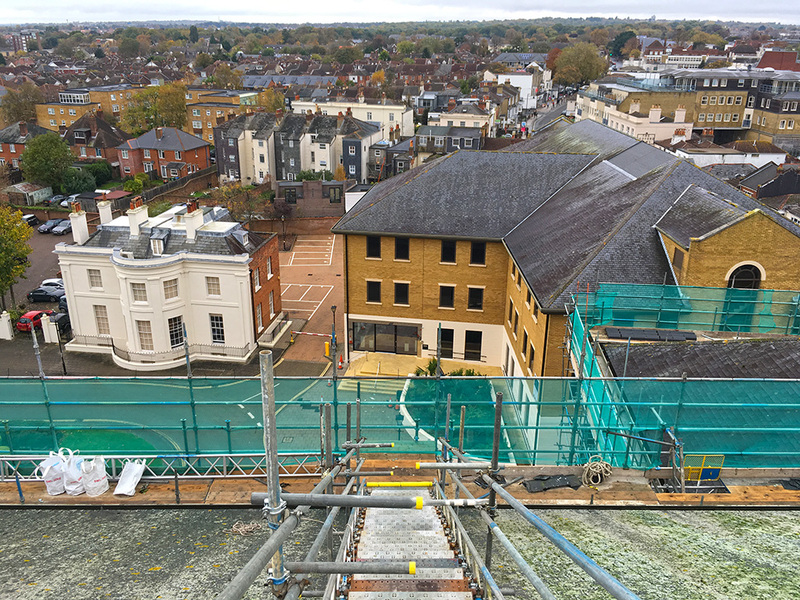 Cuplok System scaffold was used as its speed of erecting was deemed the better option due to lose tiles causing immediate danger to the public. The scaffold was fully designed as it contained numerous non-TG20 aspects. This included a 15m long staircase built off the roof built with stair treads built on existing slating at a 28-degree pitch roof. The stairs were tied through the slating to the rafters. This allowed roof work using horizontal anchor lines to work on both sides of the ridge used by Abseilers. An additional 16m beam section was used to span a low plant room roof requiring and finally a designed protection deck birdcage over the main entrance was also produced. A HAKI system staircase was also provided for easy access to roof level for all trades. 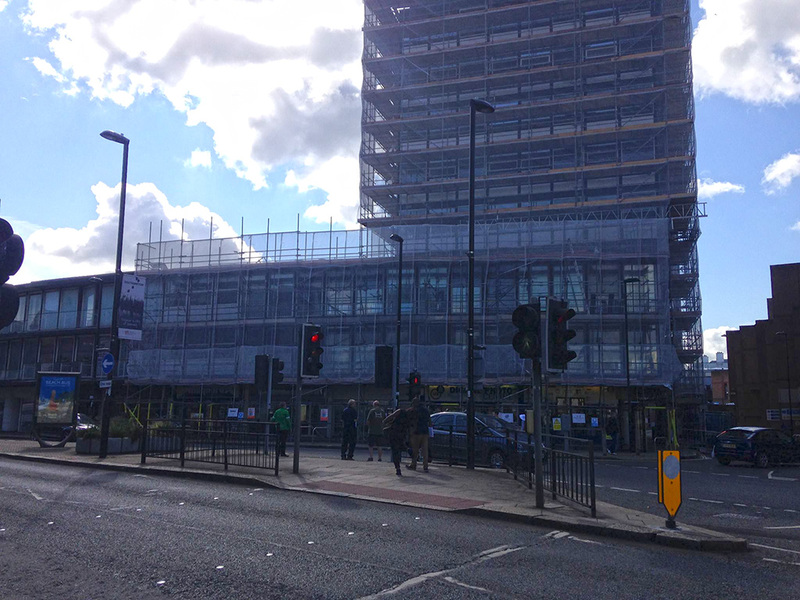 Since the project surrounded a live office space in the centre of town in the extremely busy Bedford Place area, this project represented numerous risks. To keep the front entrance accessible and safe for the office workers to enter and exit, we built a fully designed (see design and actual photos above) protection deck birdcage over the main entrance. RBS built this out of hours due to the busy nature of the main entrance during work hours. To add to this, it was important to allow safe and easy access to the disabled ramp to the left-hand side. This was made possible using a 12m bridge section connecting the Cuplok scaffold with the tube and fitting birdcage. The surroundings of the building also represented some concerns. The pavement was too narrow in areas to allow safe pedestrian access. 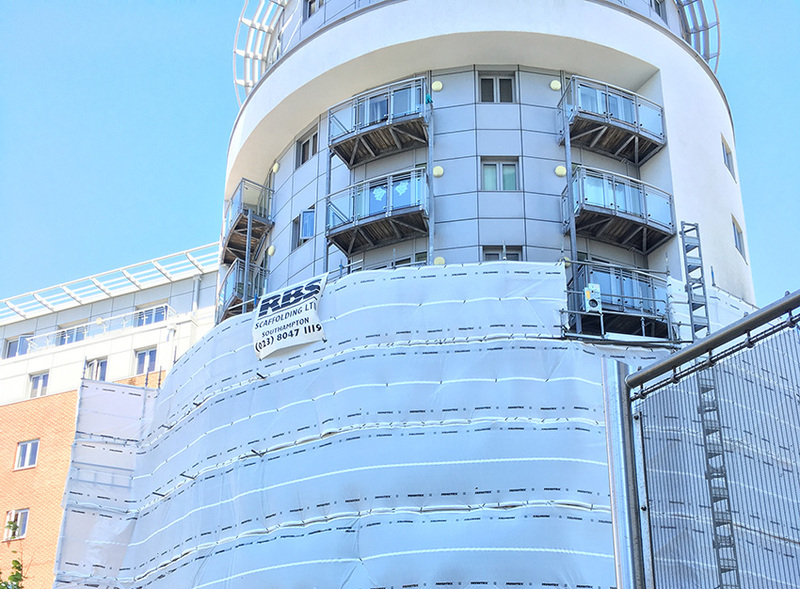 To alleviate this, RBS maintained pedestrian access by building a 6-board wide projecting fan set a minimum of 5 metres above the pavement, foam standards, lighting, double board and Mona flexing the base lift and the opening of scaffolding in key locations. Triple handrail and top lift debris netting was also provided to ensure the safety from the top lift.